Network Rail will be upgrading one of London’s busiest junctions this Christmas period, a section of track which sees around 240,000 passengers pass through every day. Battersea Pier railway station, looking in the direction of Battersea Pier Junction. 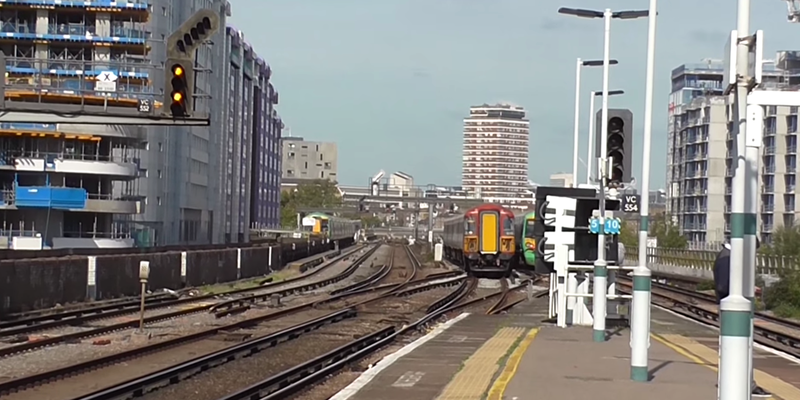 A Gatwick Express Class 442 and Southern Class 377 meet. Old track, switches and conductor rails will be replaced at Battersea Pier Junction near London Victoria. 1,300 meters of track and 1,800 meters of conductor rail will be replaced, along with switches & crossing units and point motors. Associated electrical cabling will also be replaced. It is anticipated that the renewed junction will have a life expectancy of around 35 years before more work needs doing. The work will be taking place Sunday 23rd December 2018 until Tuesday 1st January 2019. As a result, platforms 9 to 19 will be closed at London Victoria. There will be no Gatwick Express services during this time, the majority of Southern services will be diverted to London Bridge, and a reduced service between Clapham Junction and London Victoria will be in effect. It is advised that passengers allow extra time when travelling during this busy period, as train services will be very busy. It will be possible to view live train times and schedules at Rail Record closer to the time, for rail replacement bus services and reduced service / diverted trains between Clapham Junction and London Bridge.